A vocabulary sorting exercise is a great way to slowly introduce students to transitions. This is the smoothest and easiest way to start a class on transitions or essay linking words. It can start out as a class activity and then transition (!) into an individual activity. 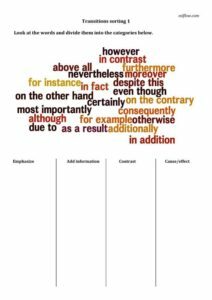 Students sort the essay transitions or linking words into appropriate categories. Giving students sentences to rewrite helps to make transitions more accessible. This takes the students deeper into the uses and meanings of transitional vocabulary. Understanding and knowing how to use transitions is essential for anyone who aims to be a good writer. 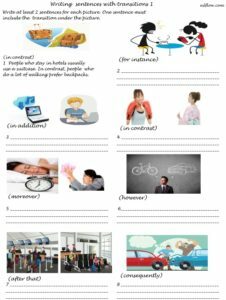 In this transitions worksheet students use the pictures and their own ideas to write appropriate sentences using transitions. For me, this is the most enjoyable activity as the pictures give the students more freedom to use their own ideas.